This place was a huge old car garage with these giant oversize chairs in the back of the room. We climbed up in one of them and smoked peyote buttons. I don't remember "Avenue Of Happiness (with their electronic synchronizer)". And I only remember not liking "Balderdash." "The Screaming Gypsy Bandits" were from Bloomington and the guitar and bass players went on to become the nucleus of MX-80 Sound. 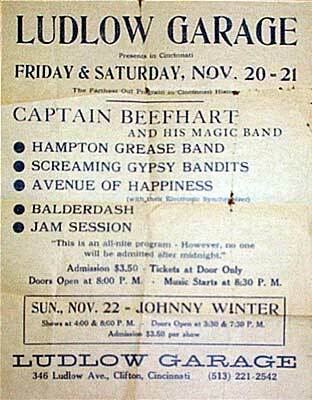 Colonel Hampton who played Scorgies in it's last hurrah with Pete's Rock Band was the main man in Atlanta's "Hampton Grease Band." Admission was only $3.50 and there were probably about 100 people in this big place for the "Farthest Out Program In Cincinnati History." I don't remember the "Jam Session" either. The small type says "This is an all night program - However no one will be admitted after midnight. I know the Magic Band played last and didn't finish until about 4 AM. They were sensational. I remember that. And Don's wife spent what seemed like hours going through her purse for something. She was just off stage in a chair with a worried look on her face.